Don't miss this opportunity to get into coveted Fishhawk Preserve at an affordable price. Upon arrival, you will notice the inviting curb appeal, lush landscape, tile roof, pavered sidewalk and driveway. Step inside to pure & simple elegance!! Featuring hardwood flooring that flows throughout the main living areas, many windows providing abundant natural lighting, open floor plan, trey ceilings, crown molding, wood trim, led lighting and more. The dreamy kitchen will take your breath away with cream cabinetry, granite counter tops, gorgeous backsplash, large center island w/ seating, farm sink, double wall ovens, gas cooktop, soft close drawers, under cabinet and pendant lighting. All main living areas overlook the sparkling saltwater pool/infinity spa with gas fire feature and travertine decking. Behind the dining area is a wall of built in shelving and drawers that can be used as both a desk and/or additional serving area when hosting guests. Behind the kitchen is a spacious walk in pantry with wood shelving and built in spice rack. The master suite is privately located off the back of the home and features a trey ceiling, plantation shutters, spacious walk in closet and spa like master bath with garden tub, shower and two separate vanities. There is a mud room/cubbie off the tandem 3 car garage and a flex room between the secondary bedrooms. 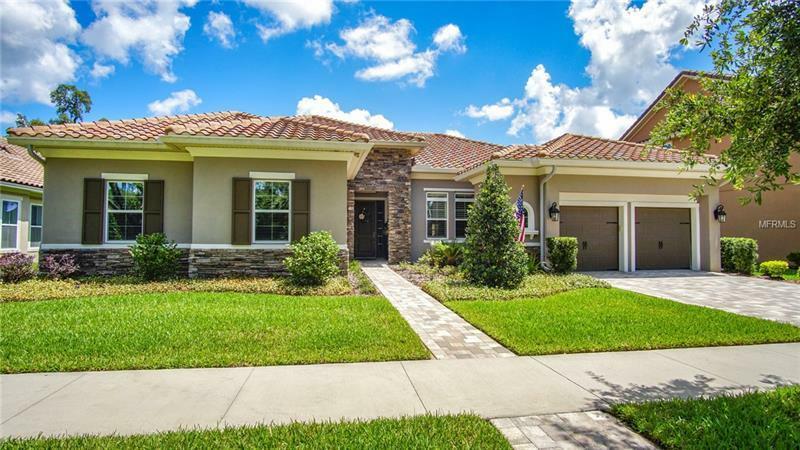 Desirable location, outstanding schools and access to all the Fishhawk Ranch amenities. All this and so much more. Schedule your appointment & see for yourself! !